TCP (Transmission Control Protocol) is a standard that defines how to establish and maintain a network conversation via which application programs can exchange data. TCP works with the Internet Protocol (IP), which defines how computers send packets of data to each other. Together, TCP and IP are the basic rules defining the Internet. TCP is defined by the Internet Engineering Task Force (IETF) in the Request for Comment (RFC) standards document number 793. TCP is a connection-oriented protocol, which means a connection is established and maintained until the application programs at each end have finished exchanging messages. It determines how to break application data into packets that networks can deliver, sends packets to and accepts packets from the network layer, manages flow control, and—because it is meant to provide error-free data transmission—handles retransmission of dropped or garbled packets as well as acknowledgement of all packets that arrive. 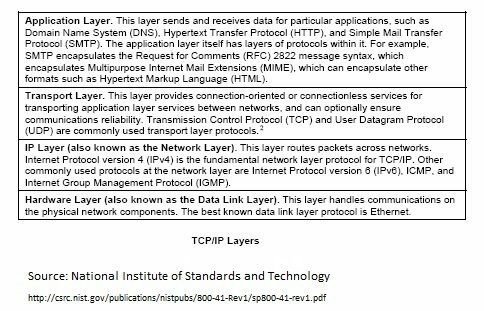 In the Open Systems Interconnection (OSI) communication model, TCP covers parts of Layer 4, the Transport Layer, and parts of Layer 5, the Session Layer. For example, when a Web server sends an HTML file to a client, it uses the HTTP protocol to do so. The HTTP program layer asks the TCP layer to set up the connection and send the file. The TCP stack divides the file into packets, numbers them and then forwards them individually to the IP layer for delivery. Although each packet in the transmission will have the same source and destination IP addresses, packets may be sent along multiple routes. The TCP program layer in the client computer waits until all of the packets have arrived, then acknowledges those it receives and asks for the retransmission on any it does not (based on missing packet numbers), then assembles them into a file and delivers the file to the receiving application. Retransmissions and the need to reorder packets after they arrive can introduce latency in a TCP stream. Highly time-sensitive applications like voice over IP (VoIP) and streaming video generally rely on a transport like User Datagram Protocol (UDP) that reduces latency and jitter (variation in latency) by not worrying about reordering packets or getting missing data retransmitted. In this video tutorial, Pieter De Decker compares the UDP and TCP protocols. The official Transmission Control Protocol is in Internet Engineering Task Force (IETF) Request for Comments 793. What is the difference between TCP/IP and IP protocol? The official protocol of the Internet! -- Chapter 1 of "TCP/IP first-step"
Why is it OK to have more errors in a real-time traffic stream? I'm curious to hear from everyone on the future of TCP. I've read several articles that say it might not be around for much longer (replaced by network coding).